Details: Outside gates of ‘Leinster House’, Kildare St, Dublin 2: 5.30pm, Tuesday 21st November. 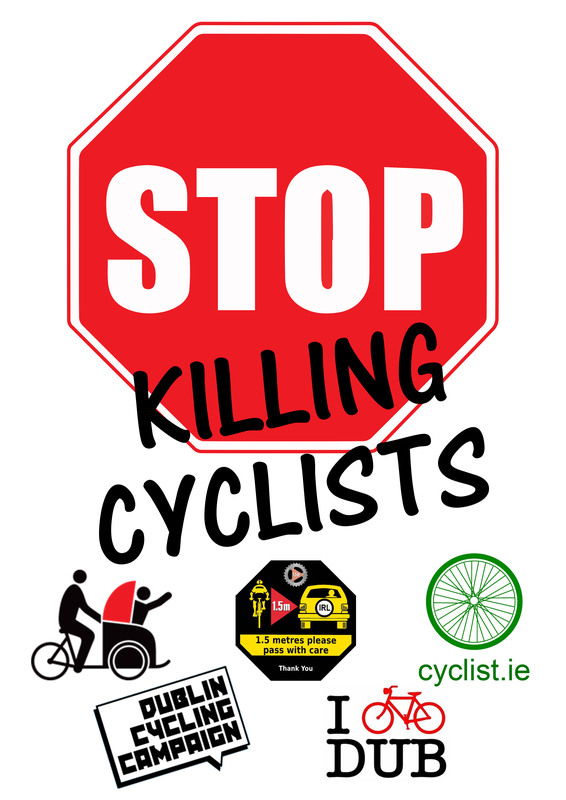 In the past week two more people have lost their lives while cycling on roads in Ireland, bringing the total number of cyclists killed in 2017 to 14*. That is *four more than were killed in all of 2016, and it makes 2017 the deadliest year for cyclists in more than a decade. The number of people who cycle who have been seriously or fatally injured is available on the Road Safety Authority’s web-page. Just yesterday we had a report on Facebook of a club cyclist clipped by an overtaking vehicle while out on a club spin. It was yet another hit-n-run caused by dangerous overtaking, which is a statutory offence covered by the Fixed Penalty-Points regime. However we never see any statistics published by An Garda Síochána to show how many Fixed Charge Notices (FCNs) are issued for this offence. We need this vital data. There is silence and inaction from the key government ministers - Minister Ross (Transport) & Minister Flanagan (Justice) - who hold responsibility for road safety and policing, respectively. Dr. Paul Corcoran (Chair of Dublin Cycling Campaign) stated that “the number of vehicles fly-parked in the mandatory-use cycle tracks on the streets of our capital, and right across the land in urban areas, during their period of operation is unacceptable. Illegally parked vehicles force cyclists out into the fast-moving traffic-stream putting riders at increased risk of being hit. They are not an aid to doing business”. Clara Clark of Cycling Without Age, www.cyclingwithoutage.ie, “asks all road planners and users to respect and look out for cyclists on all our roads. We want Cycling Without Age trishaw trikes to become an accepted form of mobility for our older and mobility-impaired citizens. Cycling offers sustainable and healthy travel to all. Motorists need to recognise and allow space for safe overtaking, safe road use, particularly at junctions, and parking for cyclists. We call on government and local authorities to consult with cyclists and cyclist groups when planning and upgrading new road layouts. For example, the new road proposals in Cherrywood in south Dublin offer unrealistic and bicycle-unfriendly junction options”. Phil Skelton of ‘Stayin Alive at 1.5’ says: “Many motorists are simply not aware of the rights of bicycle riders and the challenges they face in navigating a road system designed primarily for motor vehicles, underpinning a stubborn prejudice that bicycle riders are “rogue” road users. While bicycles are defined as vehicles, and given similar rights to cars when on the road, they face disproportionate vulnerability. The Stayin’ Alive at 1.5 campaign, has made use of social media, various awareness videos, vehicle signage, safety campaigns, press releases etc. to ask motorists to “give space” to bicycle riders. The RSA has been active in this area too, but this has been ongoing with cyclists for some time now and and although has some positive effect it doesn’t reach the target audience we need to engage, those who might view people on bicycles as road furniture, as an inconvenience, which needs to be overtaken hastily and at the first opportunity. For those unwilling to take on the message or for those dismissive of vulnerable road users altogether, introducing a minimum passing distance law would be a significant and progressive step in changing the focus on sharing the road”. This Tuesday, 21st of November, we are joining forces as #Cyclist.ie #IBikeDublin, #StayingAliveat1.5, #DublinCyclingCampaign and #Cyclingwithoutage to let the Government know that the issue of cyclists’ safety can no longer be ignored. Join us from 5.30pm as we hold a vigil in memory of the people killed while cycling on Irish roads.